Easy Cheesy Potatoes are the best side dish! 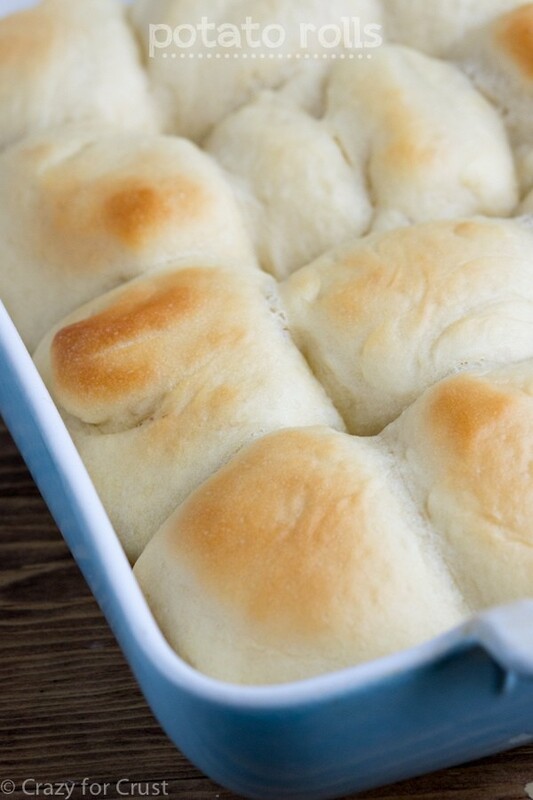 This easy casserole recipe is perfect for a potluck or holiday. 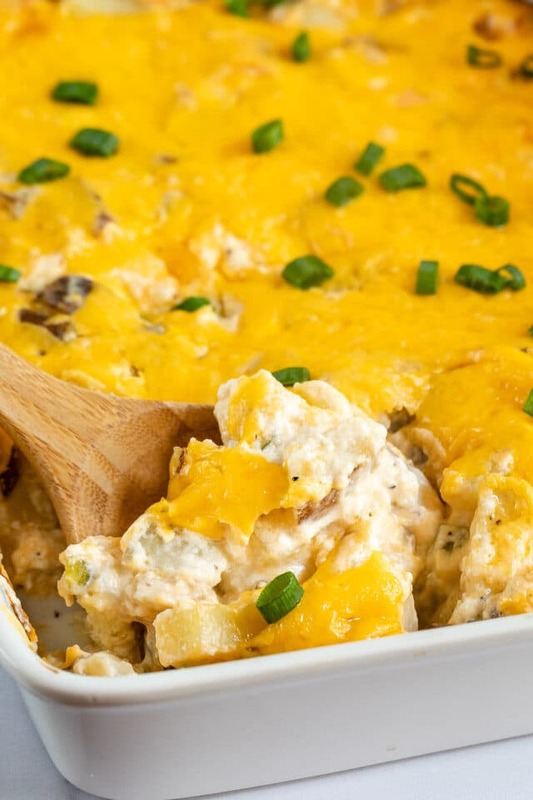 Start with fresh potatoes for a semi-homemade cheesy potato casserole! Seriously, this is one of the best cheesy potato recipes I’ve had in a long time! Several years ago I attended a potluck that had this fantastic cheesy potato casserole. It had chunks of potatoes and was creamy and cheesy and super flavorful. When I asked what it was called the host answered, “Funeral Potatoes” and I was confused. I mean…it was the middle of a summer barbecue and no one had died so the name was weird to me. Fast forward to today and Funeral Potatoes are a real thing. I guess the name stems from the fact that this easy casserole is perfect for a potluck or for bringing to a funeral because it serves a lot of people. When I started craving those potatoes last week I started scrounging the internet for a recipe but they all called for frozen hash browns. Now, don’t get me wrong, I love me a frozen hash brown but I didn’t have any and I wanted cheesy potatoes ASAP. 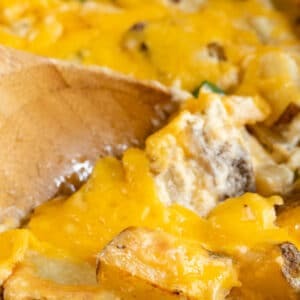 I did, however, have real potatoes in my pantry…so this easy casserole is a spin on the classic Funeral Potatoes: it’s made with fresh potatoes! Making Cheesy Potatoes with real potatoes just has one extra step but has all the flavor of that cheesy potato casserole you remember from childhood. What’s in a Cheesy Potatoes recipe? My Cheesy Potato Casserole is made with sour cream, cream cheese, condensed soup, and real potatoes. I also add a healthy dose of spices (onion and garlic) and lots and lots of cheddar cheese. It’s baked with even more cheddar cheese on top! How do you make Cheesy Potatoes with real potatoes? It’s really simple, you just have to remember one thing: pre-cook your potatoes. This will ensure they’re done in the final dish. I’ve talked a little bit about par-boiling potatoes before, but it’s a simple step that makes the best potato recipes! First, you have to dice your potatoes into small bite sized pieces. I chose to leave the skin on my potatoes because the skin is where all the healthy stuff is, plus I’m lazy. Peeling potatoes is so boring! BUT, you can peel them if you prefer. Then slice and dice them into small cubes. 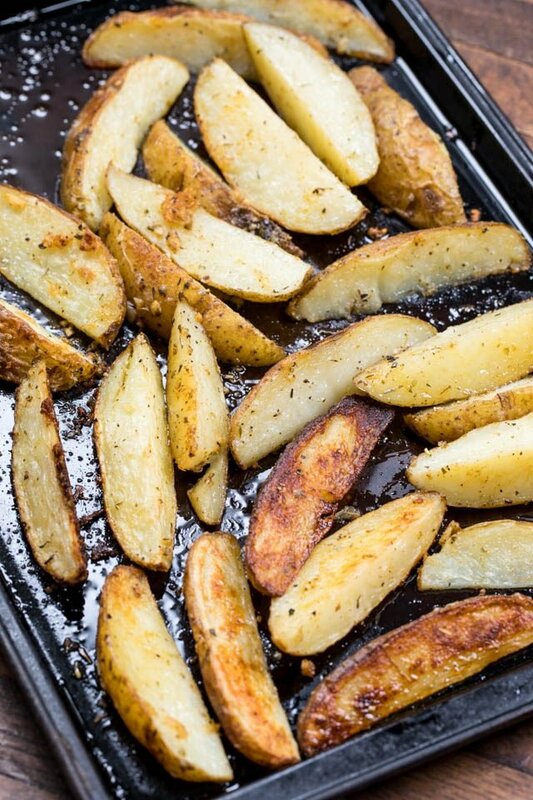 TIP: make sure your potatoes are cut int uniformly sized pieces so that they cook evenly. Microwave: place the potatoes in a microwave-safe bowl with an inch of water. Cover with plastic wrap and cook for about 6 minutes on high. Boil: boil them on the stove in a pot of water (this will take longer because the water has to come to a boil first). Either way, you want to make sure your potatoes are tender, but not so much that they fall off the fork. 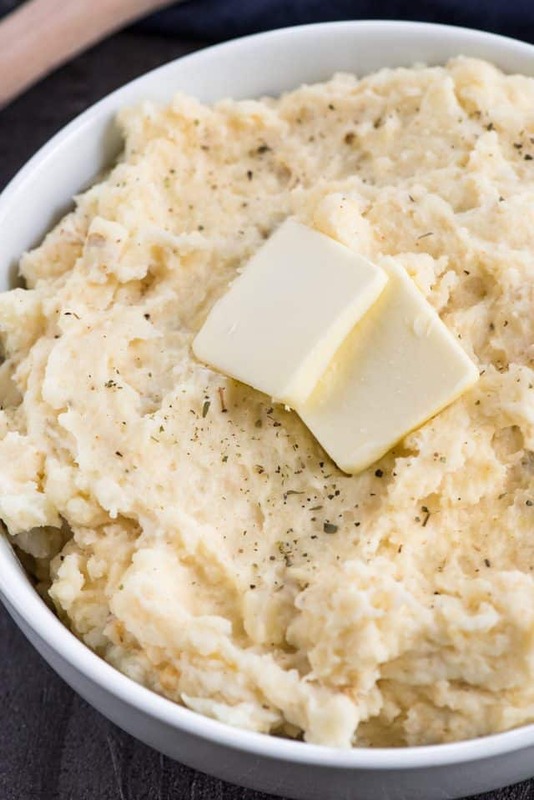 You’re not making mashed potatoes; since you’re going to bake them in the oven they’ll continue cooking. A fork should go into the potato easily but not fall off of it. That’s when they’re done. Once they’re cooked, drain them and then mix them with the other casserole ingredients. Do you use condensed soup to make cheesy potatoes? I do in this recipe, yes. I used a cream of potato soup, but if you can’t find that you can use cream of chicken or cream of mushroom. Feel free to use low sodium and/or low fat versions. Same goes with the sour cream: low fat sour cream is fine in this recipe. What kind of cheese do you use in cheesy potato casserole? I used sharp cheddar cheese because I think the amount of spices and creaminess lends itself to a sharp cheese. You can use medium cheddar, if you prefer. Also, gruyere would be fabulous, as would white cheddar or a mix of your favorite cheeses. The recipe also calls for cream cheese, which amps up the creaminess! I covered my pan with foil and baked for about 30 minutes. Then I uncovered it, sprinkled the rest of the cheese on top and baked until finished cooking, about 20-30 minutes more. Serve hot! 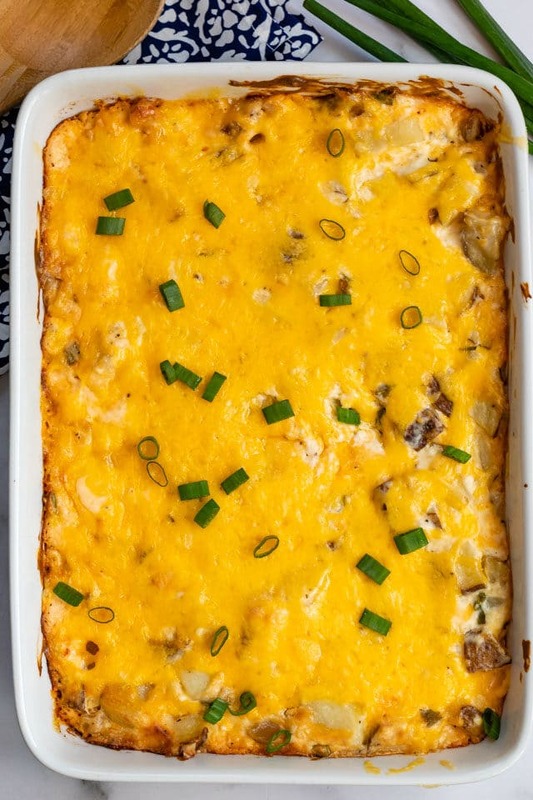 Cheesy Potatoes Casserole is the perfect side dish made with fresh potatoes and lots of cheese! This is the perfect potluck dish. Preheat oven to 350°F. Spray a casserole dish with nonstick cooking spray. Meanwhile, mix together the cream cheese, soup, spices, sour cream, and milk. Stir in the green onions and 2 cups of the shredded cheese. Bake for 30 minutes. Remove the foil and add the remaining cheese. Cook until the potatoes are cooked through and cheese is melted and bubbling around the edges, about 20-25 minutes more. Serve hot. Store leftovers in refrigerator.